Salt Lake City has a rich economic history that dates from the time it was settled in July 1847. That history is discussed in detail in the July 25, 1914, issue of The Salt Lake Tribune. When Latter-day Saints settlers arrived from the East, they quickly found that the Salt Lake Valley had a large reserve of copper just west of the Wasatch Front. A Salt Lake Tribune article published in November 1919 observed that mines quickly sprang up in the Salt Lake Valley and became an asset to Utah’s economy. 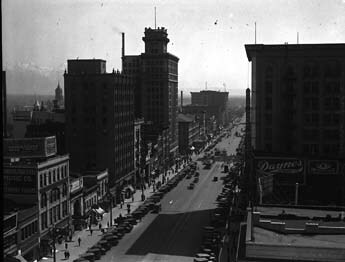 A view of Main Street, in downtown Salt Lake City, where most businesses were located. The image was made shortly before the onset of the Great Depression. Special Collections Department, J. Willard Marriott Library, University of Utah. Today the economy of the Salt Lake Valley is still strong, but has changed drastically from the mining town it once was. Looking at downtown Salt Lake City today, one sees high-rise business buildings and large universities. 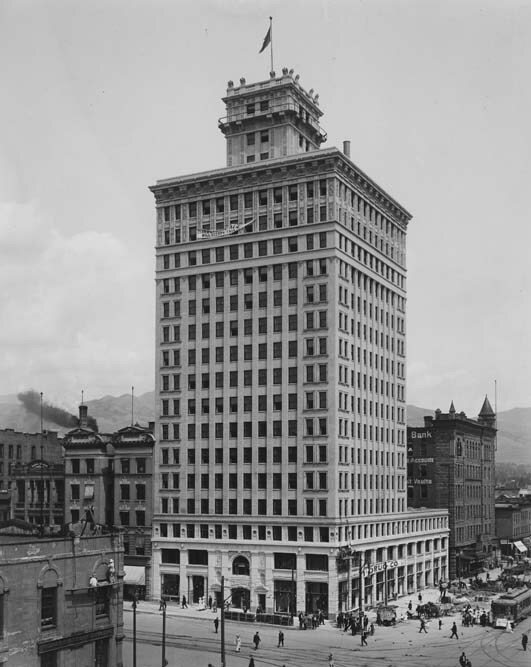 Now one of the largest industries in the Salt Lake Valley is the banking industry, with the Chase tower and Wells Fargo tower located downtown. The economy is strong and the unemployment rate is low. But Salt Lake wasn’t always one of the economically strongest cities in America. There was a time, in fact, when it had one of the highest unemployment rates in the US, and poverty was at an all-time high. It all began in 1929, when the stock market crashed at the end of October. Before the stock market crash, most people were either employed by the mining companies just west of Salt Lake or worked in factories in Salt Lake. But what was the city like a year after the market crash? We know that the effects of the stock market crash weren’t really felt in the first couple of months. Many commented on the stock volatility, but many were optimistic at first. Then after several months, the full effects of the crash were realized. We will take a look at what Salt Lake City economy was like a full year after the 1929 stock market crash on Wall Street. One of the many mines that were located just west of Salt Lake City. They were the driving force of the economy in the 1920s, but saw difficult times in the 1930s. Special Collections Department, J. Willard Marriott Library, University of Utah. By the end of 1930, the stock market crash had reached all parts of the United States. Utah and the Salt Lake Valley had been hit especially hard. Their main source of employment had come to a halt; the coal industry and agricultural industry had decreased dramatically during that year. The Salt Lake Telegram reported on March 20, 1930, that the poor economy, plus several fatal mine explosions, caused the coal companies to lay off a large portion of their workers. Making matters worse, the agricultural industry In the Salt Lake Valley had decreased by almost half, causing even more local lay offs. So how bad was it a year after the great depression hit? Some newspapers were optimistic regarding the stock market, claiming that stocks were on a rise and that jobs were being created every day. (Walzer) The reality was quite different, though. An article published in the Salt Lake Telegram exactly one year after the crash tells the story of a man who killed himself and his two sons by jumping off a building. This man had lost his wife the year before, and shortly afterward he lost his job as a tailor and never found a new job. Out of desperation, he committed suicide. While this was not representative of every situation in the Salt Lake Valley, it is a good reflection of the disparity many of the residence were in. The Walker Bank building, built in 1912 and located in the heart of downtown. The bank struggled during the 1930s due to the Great Depression. Special Collections Department, J. Willard Marriott Library, University of Utah. At the year mark the Depression was in full effect in Salt Lake City and the whole valley. Unemployment was at an all-time high, reaching over 10 percent, according to Dean May. That statistic was one of the highest in the country, and was still rising. This was one of the lowest points in Salt Lake City’s history. Although unemployment was at an all-time high, there were several reports of local stimuli as well as government-assisted stimuli that were put in place. On October 30, 1930, the Davis County Clipper reported construction of a new office building. Its purpose was to offer office space at a cheaper rate than that of a similar building in Salt Lake City and thus stimulate small business in Salt Lake City and encourage the employment of more people. This is not the only case of artificial stimuli being implemented in the Salt Lake Valley. In December 1930, the Clipper reported that the federal government was getting involved. The proposed project was a new waterway system to be put in Salt Lake City to supply clean water to residents. This stimulus project was supposed to employ up to a thousand new government employees. Alexander writes that by the one-year anniversary of the stock market crash, things were steadily worsening. The first year there was an additional 5.1 percent of unemployed. That doesn’t sound too bad, but the jump from the first year and the second year was 21.9 percent unemployment rate. The government knew it needed to get involved. Unfortunately, the federal government was spread thin at this point, so most of the burden fell on county government and private relief. At the time one of the largest groups in Salt Lake City was people of the LDS faith. Dean May wrote that in Salt Lake City at the time, about half the residents were members of the Church of Jesus Christ of Latter-day Saints. Most of the aid came from the church’s relief programs. Over 70 percent of the families receiving welfare from the LDS relief programs were not of that faith. Salt Lake City was one of the hardest-hit cities in America. The stock market crash affected not just individual families but also whole communities. The first year was a hard year and it only got harder thereafter. Dozens of banks shut down, farms went out of business, and the mining industry suffered. The unemployment rate was growing and people were in the pit of despair. Welfare programs were just coming to the rescue, but help was hard to find. The year after the great Wall Street crash was a tough time for people in the Salt Lake Valley — and the worst was yet to come as the Great Depression took hold. Joey Kingston is a junior at the University of Utah majoring in marketing with a minor in media communications. He expects to graduate in spring 2015. “Cement firm sues Ogden state bank,” The Salt Lake Telegram, August 31, 1934, 5. Edward Pickard, “Inland water way projects being pushed thorough to give jobs to unemployed,” Davis County Clipper, December 5, 1930, 3. “New office building announced,” Davis County Clipper, October 31, 1930, 6. Elmer Walzer, “Stock values climb fast as trading ends,” Salt Lake Telegram, October 30, 1930, 6. “Man kills self after two attempts fail,” The Salt Lake Telegram, October 30, 1930, 5. “Mine inspector blames lack of supervision in fatal mine explosion,” The Salt Lake Telegram, March 20, 1930, 8. “Banker defends mining industry,” The Salt Lake Tribune, November 14, 1919, 2. “Pioneer day celebration is big success,” The Salt Lake Tribune, July 25, 1914, 4. Alexander, Thomas. Utah, The Right Place. Salt Lake City: University of Utah, 2003. May, Dean. Utah: A People’s History. Salt Lake City: University of Utah, 1987. On May 1, 1900, there was an explosion in the Winter Quarters Mine, Number 4 shaft. Winter Quarters mine is west of Scofield, which is located southeast of Provo. The Winter Quarters Mine was a coal mine. According to A History of Carbon County: “The best possible explanation of the cause of the explosion was the coal dust had not been kept at a safe level. The state inspector’s report stated that one miner accidentally ignited a keg of black powder in the mine which ignited the coal dust.” (Watt, 148-149) Although the explosion involving the ignited coal dust happened in the Number 4 shaft, those who were in the Number 1 mine also were affected because the two mines were connected. Those who died in Number 1 were not killed immediately, but rather were poisoned by the carbon monoxide and carbon dioxide. According to J.W. Dilley, author ofHistory of the Scofield Mine Disaster: “Dr. E.B. Isgreen lives in Scofield and has practiced for two years …. He said suffocation by gas may have caused the death of those examined. He noticed in treating some of the miners, who went into the mine later as rescuers, that there was a smell of poisonous odor. Some seemed to have struggled before death came, as the bodies showed great bodily violence.” (Dilley, 55) Because this was a small community comprised mostly of mining families, it had a huge impact on everyone. This also had a huge impact on Utah history in that this mine disaster had the most deaths compared to any other mine disaster in the state. It also was the worst in the country at that time. Many women not only lost husbands, but also sons. It was a devastating time for this community. My great-grandfather, Emil Isgreen, was working as a doctor in Scofield at this time. He later wrote a journal of his memories from what happened and included many of his findings and personal experiences with the mine disaster. I will compare and contrast the things he wrote about the explosion and what was written in newspapers in the subsequent days. This was something that not only affected those who were right there in Scofield but also those who were throughout Utah and even all over the nation. On May 3, 1900, The Deseret News reported that President Loubet of France had sent a message to President McKinley with his condolences regarding the mining disaster that happened in the Winter Quarters mine. Four days after the disaster, The Deseret News reported on the front page the number of miners who had died from the tragedy. “Five brought out this morning and the other four all located, which makes a total of two hundred and fifty corpses.” (May 5, 1900) In all of my research I have found that this number has been different in every article that I have read. This number varies from 200 to 250 in contemporaneous newspaper accounts. On May 7, 1900, The Deseret News asked: “Will the number ever be learned? … Dr. Seymour B. 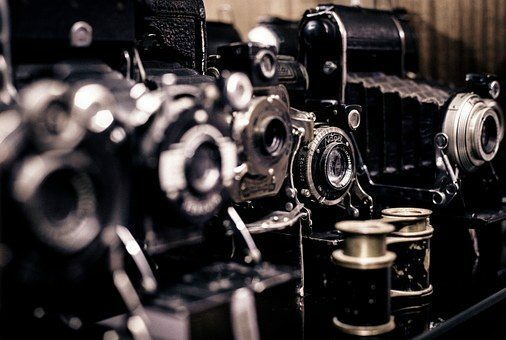 Young counted two hundred and two — others who have been on the ground continuously insist upon the number of being dead near two hundred and fifty — News correspondents invariably make a higher count than does the company.” Even within the same newspaper the number is uncertain. Isgreen reported 202 men had died in the mine. In every instance of reporting from this explosion we can see that it was a devastating thing to happen to the community and the state. I found that for the most part the reporting from both my great-grandfather and fromThe Deseret News was the same. There were some small differences, but overall it was a true report of what was going on at that time. I was interested to see the personal way of writing; the newspaper listed names and told the stories of the people who had been killed. In today’s reporting we get the facts but many times leave our hearts out of reporting. I felt as I read the many articles that it had the potential to be a personal experience for everyone who was reading the articles. To me this has a great significance for communication history because it shows how history was reported and even more importantly how we have changed over the years. To me this shows that our society has become detached and not as caring about the details. But also from their style of reporting, you can see that the problems were not necessarily addressed. And when the investigative reporting was addressed it was in a small article. This shows that it is good to have the stories in the articles but because the investigative reporting was not up to par at this time we might be missing some of the important details that could be beneficial to us in this day. One struggle that I had with writing this paper was that many of the newspapers did not go back to 1900. Some newspapers went further back than 1900, but for some reason the year 1900 was missing from the archives. I felt that it made my research difficult in that I got almost all of my primary resource information from The Deseret News. This made it difficult to find variety in my research. One source that I was planning on relying on, The Salt Lake Tribune/ Salt Lake Telegram did not have the year 1900 for me to look up. I felt that the broad scope that I wanted to have became narrow and limited. Emily Johnson Keyes graduated in May 2010 with a bachelor of science in mass communication from The University of Utah. Journal of Emil Isgreen, author’s collection. “Death’s Awful Harvest At Winter Quarters,” The Deseret News, May 2, 1900, 1. “Sympathy of France,” The Deseret News, May 3, 1900, 1. “Terrible Mutilation,” The Deseret News, May 3, 1900, 1. “State Mine Inspector Thomas Says There Was Neglect,” The Deseret News, May 4, 1900, 1. “All the Miners’ Bodies Are Found,” The Deseret News, May 5, 1900, 1. “Will The Number Ever Be Learned,” The Deseret News, May 7, 1900, 1. “Efforts for the Fund,” The Deseret News, May 9, 1900, 1. “The Mining Review,” Salt Lake Mining Review, May 15, 1900, 6. Ronald G. Watt. A History of Carbon County. Salt Lake City: Utah State Historical Society, 1997. J.W. Dilley, J.W. History of the Scofield Mine Disaster. Provo, Utah: Skelton, 1900. On the morning of May 1, 1900, the most deadly explosion the United States had witnessed up until that point tore through the Winter Quarters Mine in Utah. The coal mine, owned by the Pleasant Valley Coal Company of Carbon County, was located just west of Scofield. 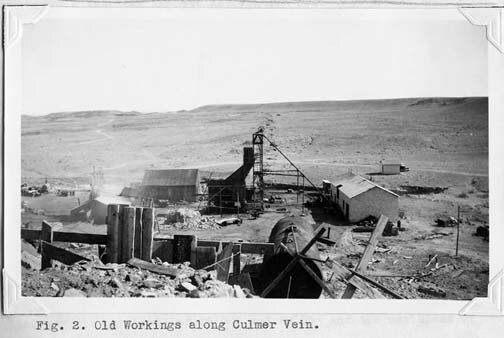 Work at the mine provided the incomes for many of the families in the area. The explosion occurred when a significant amount of coal dust in the tunnels caught fire, resulting in the deaths of at least 200 men and young boys. Many of the deaths were not caused by the explosion itself, but by the carbon monoxide gas that was released in the blast. Some of the men trying to escape made their way through the Number Four mine, the quickest way out of the mines, but were suffocated before they could reach the opening. A similar incident took place seven years later, when a West Virginia coal mine exploded causing the deaths of 362 men and boys. According to an online article published by Boise State University, titled “Monongah Mining Disaster,” that explosion disrupted the ventilation system and also blocked several mine entrances, causing poisonous gas to accumulate and remain trapped within the tunnels. The media coverage had a tremendous effect on the community’s response to the mine tragedy. The Deseret News, as well as other news sources, brought reports of the disaster into American homes and helped to create a strong sense of community in the area. Perhaps most important was the media’s ability to spread awareness. Newspapers at the time not only gave details about the incident, but also painted a vivid picture of the grief and destruction that the affected families faced. The Deseret News, a Utah newspaper, tirelessly covered the events of the tragedy as they unfolded. Readers of the paper could find news about the funeral plans, fundraising efforts, and the struggling families of the dead miners. Reporters captured the suffering caused by the explosion by using both eloquent and stirring language to describe the scene. The detail and imagery used in many of the newspaper articles, like the one mentioned, likely influenced the public to feel sympathy for the grieving widows and children. Donations and fundraisers continued for months after the disaster. An article published in the June 5, 1900, Deseret News stated, “Philanthropic ladies raise nearly one thousand dollars more,” referring to a ladies group that was still meeting to collect money for the mine victims’ families. Also influential in the public’s willingness to give were the petitions of the Utah governor of the time, Heber M. Wells, for support of the grieving community. According to an article in the Deseret News published May 8, 1900, Governor Wells quickly established a relief committee to aid the families of the deceased. He also made an eloquent appeal to Utahns, and later one to the whole American public, to be generous in their support for the poor Utah women and children. People everywhere wanted to know more about the disaster and to find out what was going to be done to help the community. In a May 8, 1900, article, “Agony of the Bereaved,” the Deseret News reported, “All along the line of travel the people are greatly agitated over the mine disaster; papers are in such demand that five times their price has been refused; they are read aloud to listening groups at the post offices.” The news of the tragedy was also far reaching. Within the days following the disaster, the news had reached the White House. According to the May 4, 1900, edition of the Deseret News, President McKinley sent a telegram to Governor Wells on May 3, expressing his sorrow over the tragedy. The Scofield Mine Disaster was one of the most damaging coal mining tragedies in the United States. On the surface, the incident was the cause of grief and major losses for the wives and children from Manti to Coalville. It cost families both their livelihoods and their only means of assimilation into a foreign society. However, the common grief caused by such a massive loss helped to create a stronger sense of community. Newspapers like the Deseret News vividly described the days that passed between the first news of the explosion, and the heart wrenching funeral services where the dead found their final resting places. Both Utahns and those living outside the state were touched by the stories of the women and children struggling to accept their losses. They were quick to offer their support and their sympathies. The newspaper offered a means for connectedness to exist among those affected and those interested in the story of the mine. The Deseret News provided a vantage point from which those affected could step back and see the bigger picture of what had happened. It also created a road map for outsiders to follow along and have an understanding of what was going on in the Scofield area in the aftermath of the explosion. Thus, the paper was critical in not only chronicling the event in history, but also in shaping the public view of what had taken place May 1, 1900. Jessie Warmoth is a senior at the University of Utah. She is majoring in mass communication. “Agony of Bereaved,” The Deseret News, May 4, 1900, 3. “Arrival of the Dead – A Fortunate Misfortune,” The Deseret News, May 8, 1900, 8. “Eleven Coalville Citizens Among the Victims – Escape,” The Deseret News, May 8, 1900, 7. “God Help Her,” The Deseret News, May 8, 1900, 5. “Jordan Stake Conference,” The Deseret News, May 8, 1900, 5. “Last Rites at Ogden,” The Deseret News, May 8, 1900, 5. “McKinley Extends His Sympathy,” The Deseret News, May 8, 1900, 5. “Official Report on Mine Disaster,” The Deseret News, June 5, 1900, 7. “Scofield Fund Increased,” The Deseret News, June 5, 1900, 5. “Utah Now Appeals to the Nation,” The Deseret News, May 8, 1900, 6. Yvette D. Ison. “The Scofield Mine Disaster in 1900 Was Utah’s Worst.” Utah’s History to Go. State of Utah, 1995. Floyd A. O’Neil. “Utah’s Twentieth Century History: Reprise and Nostrum,” Utah Historical Quarterly (Spring 2006): 6. Allan Kent Powell. “Scofield Mine Disaster.” Utah History Encyclopedia. “My Darling Clementine.” Monongah Mining Disaster. Boise State University.